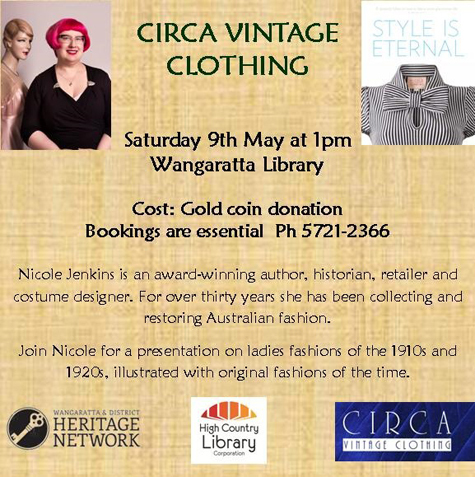 This Saturday, join me at Wangaratta (one of my favourite towns) for a talk on fashions from 1910 to 1929. This is the first time I’ve presented this event, and I’ve acquired several lovely authentic pieces for the event. There’s a lot of change in fashion and technology during these two decades so it should prove to be very interesting, with themes including WW1 and the Wall St crash. What: Talk on fashions of 1910s and 1920s. I would love to come simply because my daddy was born in Wangararatta. But don’t think I’ll make it from Sydney.